inverter performs two key functions: it performs the DC to AC conversion, and it optimizes the modules' Maximum Power Point Tracking (MPPT). Traditional solar energy installations deploy a single centralized inverter to convert the DC output from multiple solar modules into AC power. 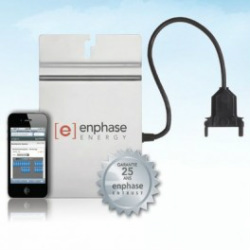 The Enphase Approach The Enphase Microinverter System is a fully integrated device that converts the DC output of a single solar module into grid-compliant AC power. This integrated system maximizes energy harvest, increases system reliability, and simplifies design, installation and management. Per-module Maximum Power Point Tracking (MPPT) contributes to energy harvest gains of 25%. The Enphase Microinverter system is the first commercially-available microinverter system for residential and commercial solar PV applications.